I tried to bootcamp my Mac. Ran into some issues which left me with two partitions, my main partion and the extra one create for bootcamp installation. Tried to merge it using the bootcamp programme, but didn’t give me the option. Went to disk utility and tried to merge them through the GUI, wasn’t working. The minus button was not highlighted. Then went into terminal and tried to delete the partion as free space and then merge to one partion. This worked in part, the second partion is deleted but I can not restore the main partion back to it full volume size. I’ve lost space, where I had over 1TB free I know have only 750GB. I have no idea how to get it back. Any help would be appreciated. You can not recover 300 GB of free space because the small 104.9 MB EFI partition is between the APFS container and this free space. The command below will remove the EFI partition and add the 104.9 MB to the 300 GB of free space that already exists. 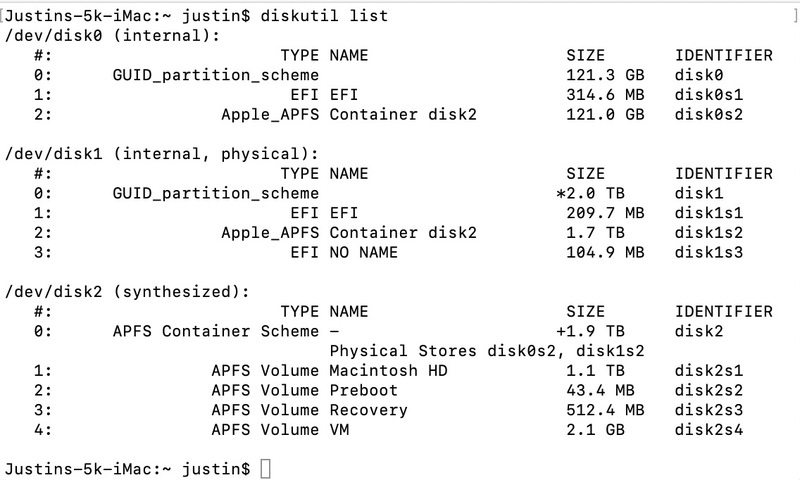 The next command will expand the APFS container to occupy the free space. If you still feel the "Macintosh HD" volume (disk2s1) is occupying to much space, you may want to ask a new question to address this problem. Not the answer you're looking for? Browse other questions tagged bootcamp hdd . Disk problems and reinstalling Mavericks!